** Just to get it out there, we literally laughed when 3 out of 4 of us showed up wearing scarves. 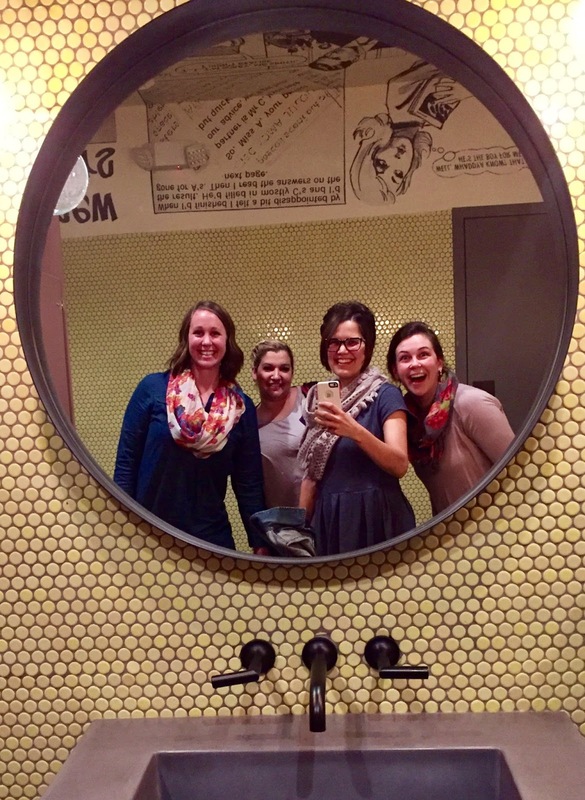 Apparently that's what mom's do when they go out...wear scarves and take bathroom selfies. It's crazy to think how my relationships with friends have changed over the years. And I'm not even talking about relationships with specific friends, but relationships in general. The other day I was in a conversation with a mom who had a high schooler and it got me reminiscing. I remember how it was literally the end of my life it I had to be home for more than, say, 15 minutes. These days, the thought of leaving the house can feel daunting at times. Taking three kids to the mall just to relax and browse...well I would rather stab a pencil in my eye and relax at the hospital than do that. Yeah, slight exaggeration, but you get the point. At the end of a long day, after making numerous meals and snacks, doing school runs up the wazoo, changing diapers and keeping the house in a semi orderly state, the last thing I want to do is go out with friends. Because of this, my relationships have suffered. Friendships require effort. And just like marriages, they require sacrifice. Sometimes that sacrifice is staying out of my pjs for a couple hours longer and filling my soul by laughing my head off with good friends. Good friends are really worth their weight in gold. Besides attempting to be a better friend through sending notes, reaching out, helping, etc, one thing I want to do this year is actually go out and enjoy myself more with my friends. Because, let's be honest, a play date with 13 kids and 4 moms is hardly relaxing! Yeah, all my friends have a crap load of kids. No, one and done happening here in Modesto! And here's what's ironic. I never ever wish I had just stayed home. I am always glad I went out...even if I regret it the next morning. But even then, there are the group texts with us all whining together about being tired and comradery is always a good thing. So here's to a year of dating my friends. Of staying out of my pjs a little bit longer and laughing hysterically together. Of finding people to watch our kids so we can bare our souls to each other over coffee. Because, my tribe, you really are worth it. I may have cried a little. I treasure you so. Even for this extrovert over here, my friendships constantly evolve and change. I'm so thankful we have been through some of these changes together and I know we have so many more memories to make!